Democrat Dana Nessel Narrowly Defeated Republican Tom Leonard In The Closest Statewide Race At The Top Of The Ballot. It Was The Most Expensive Attorney General Race Michigan Has Seen. LANSING (March 11, 2019) — As Democrats wielded significant financial advantages in Michigan’s 2018 races for governor and secretary of state, the campaign to be the state’s top law enforcement official was a different story. 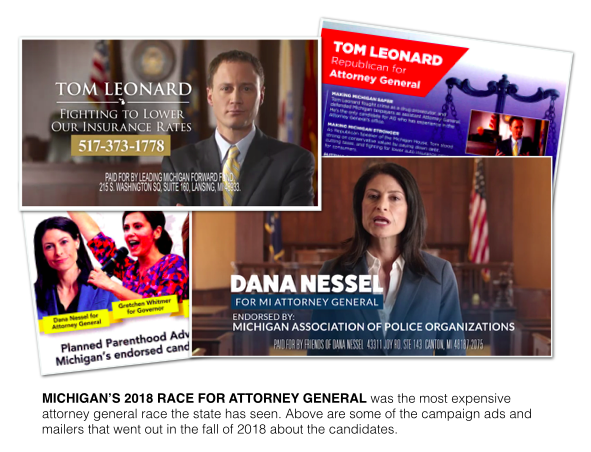 An analysis of campaign finance disclosures and TV ad-tracking data shows that Republican groups poured money into the race for attorney general, unsuccessfully trying to help then-GOP House Speaker Tom Leonard defeat Democrat Dana Nessel. 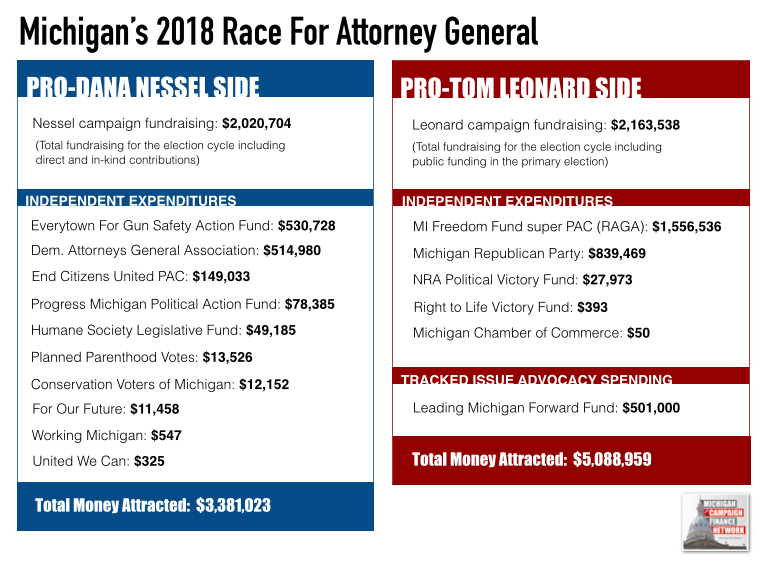 The race saw a record amount of money overall for an attorney general contest in Michigan and a record amount of spending by groups acting outside of the candidates' campaigns for an attorney general contest in Michigan. Overall, the race attracted about $8.4 million with Nessel’s campaign raising $2.0 million and Leonard’s campaign raising $2.1 million. However, there was also about $4.2 million spent by groups that were at least somewhat independent of the candidates. Of that total, $2.9 million benefited Leonard by either promoting him or criticizing Nessel. Michigan’s last race for attorney general, which was won by Republican Bill Schuette and was the most expensive at that point, attracted about $7.9 million. However, only $3.0 million came from outside groups that year. At the end of the 2018 race, Nessel beat Leonard by fewer than 150,000 votes. Nessel got 49.0 percent while Leonard got 46.2 percent. It was the closest statewide contest at top of the ballot. In the months before the election, polls showed Democrats having leads in the races for U.S. Senate and governor, but Republicans were hoping they could break up the Democratic wins by defeating Nessel. Nessel had to win a competitive race at the Democratic state convention just to get the party’s nomination. The Michigan Freedom Fund super PAC, an organization connected to the Republican Attorneys General Association, spent $1.5 million to try to help Leonard, who held the top position in the Michigan House. The Michigan Republican Party also reported spending $839,469 on independent expenditures to benefit Leonard, and a nonprofit organization called Leading Michigan Forward Fund spent about $501,000 on TV ads promoting Leonard, according to an analysis of TV ad-tracking data. Leading Michigan Forward Fund incorporated in Michigan in February 2017, according to a public filing with the state. Leading Michigan Forward Fund’s ads didn’t tell people expressly how to vote and thus, the group didn’t have to report where its money came from or how much it was spending. MCFN tracked its spending through disclosures made by TV networks and cable providers. As for the Michigan Freedom Fund super PAC, which is different from the DeVos family-connected nonprofit Michigan Freedom Fund, its top donor was Miriam Adelson, the wife of casino mogul Sheldon Adelson. She gave $221,886. Other large donors were Facebook Inc., Dish Network, CVS Pharmacy, Home Depot and the American Chemistry Council. Each gave $50,000. While the Republican Attorneys General Association used the Michigan Freedom Fund super PAC to help Leonard, the Democratic Attorneys General Association (DAGA) also got involved. DAGA spent $514,980 on the race, according to disclosures. Of that total, the DAGA MI Peoples Lawyer Project, a super PAC, spent $464,980 to oppose Leonard. The super PAC’s money came from the national DAGA account and the American Federation of State, County and Municipal Employees. Everytown for Gun Safety Action Fund, a New York-based nonprofit organization that says it works to combat gun violence, reported spending $530,728 in support of Nessel. Nessel and Leonard both had to win convention races to earn their parties’ nominations. Nessel defeated former U.S. Attorney Patrick Miles. Leonard defeated then-state Sen. Tonya Schuitmaker. Throughout the election cycle, including the convention race and general election, Nessel raised $1.9 million in direct contributions and $92,989 in in-kind contributions. Leonard raised $2.1 million in direct contributions and $14,634 in in-kind contributions. For 2018, the most an individual could give a candidate for attorney general was $6,800. A political action committee (PAC) could give $68,000. Political party committees and the candidates themselves could give more. Nessel’s top donors were the United Auto Workers Michigan PAC ($68,000), the American Federation of State, County and Municipal Employees ($68,000), the Democratic Attorneys General Association (in-kind $56,800), the Michigan Regional Council of Carpenters ($40,000), members of the Bernstein family and the Bernstein Family PAC ($30,400), the Michigan Education Association PAC ($30,000) and the Michigan Association for Justice PAC ($30,000). Leonard’s top donors were the Michigan Republican Party ($102,768), the Realtors PAC of Michigan ($68,000), the Michigan Values Leadership Fund, a Leonard leadership PAC ($68,000), the Chatfield Majority Fund, a PAC connected to Rep. Lee Chatfield ($67,500), the Michigan Values Leadership Fund II, another Leonard leadership PAC ($60,000), the Auto Dealers of Michigan ($37,500) and members of the DeVos family ($34,000).